This morning, I tried a popular English breakfast of sardines and curry eggs. Sardines are small Pilchards, and are commonly tinned as are tuna and anchovies. 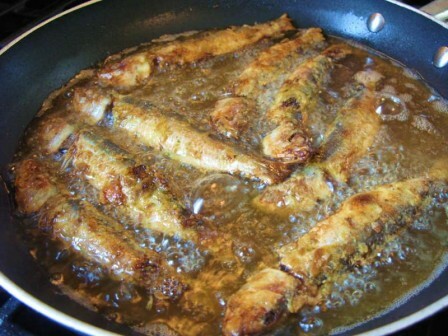 This morning I drained the sardine fillets, dredged them in seasoned flour and tenderly fried them in olive oil. My husband scrambled the eggs with curry powder, and made the toast. It was a delicious meal, with our hot tea (with milk and sweetening) and lemon curd for topping the toast. We agreed that our sardines tasted much like salmon, which we both enjoy. I will try broiled sardines the next time I wish to have a cooked breakfast.